Will insurers, MDs, patients pay for $14,000-a-year cholesterol fighting drug? Amgen saw its stock tumble late last week after it announced at a major cardiologists’ conference the results of Repatha, its major new heart care drug also known as volocumab . It is supposed to be given along with a statin to further help cut cholesterol. The drug maker hoped it would show major improvements for patients with cardiac disease. As Stat, the online news site reported, Amgen said that, based on tests with 27,000 patients, Repatha and a maximum statin dose meant that, “Those who got Amgen’s drug were 15 percent less likely to suffer a bad outcome, defined as heart attack, stroke, hospitalization for chest pain, placement of a stent, or death. However, looking at death rates alone, there was no significant difference between” those taking Repatha and those not. Amgen had hoped to stronger results with its new drug, which aims to lower LDL, or “bad,” cholesterol by blocking a protein called PCSK9. The New York Times reported the drug performed closer to upper levels of expectations in the $1 billion trial, paid for by Amgen and published in the New England Journal of Medicine. This new approach to heart care and cholesterol reduction was expected to create potentially a $3 billion new market. 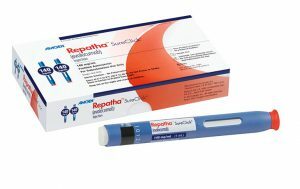 But Repatha now carries a $14,000 annual list price, astronomically higher than a generic statin that might run a few dollars a month. Physicians might be reluctant to prescribe it at that price and with only modestly more effectiveness. Insurers likely would balk at its cost. I’ve written before about the Number Needed to Treat, an evidence-based scoring system that can give clinicians and patients a fast snapshot in a single figure the effectiveness of a drug or treatment. A five-year regimen of regular statin care has been estimated to have a life-saving NNT of 83, meaning that it took that number of patients receiving the drug for one to benefit. Repatha’s NNT has been calculated by one published researcher as between 33 and 50. What happens if you’re a drug maker and the public, regulators, and lawmakers turn up the heat when you take an existing medication costing $1,000 annually, convince product overseers it’s an “orphan drug” that can be used to care for a rare condition, and then you jack up the price to $89,000 a year? Marathon Pharmaceuticals decided the better part of valor was to dump Emflaza, its Duchenne muscular dystrophy drug to PTC Therapeutics, a South Plainfield, N.J., company, for $140 million in cash and stock, the Chicago Tribune and others have reported. The paper reported that “Marathon also will receive payments from PTC based on sales of … Emflaza, starting in 2018. Additionally, Marathon may receive a one-time $50 million payment if the drug reaches a sales-based milestone.” PTC, which has other medications already for Duchenne’s, hasn’t said what it plans to charge for the drug. Duchene’s is an inherited condition that afflicts 1 in 3,600 boys, and because it worsens rapidly, few survive into their 20s. Questions have arisen about Emflaza and its effectiveness with Duchene’s. Marathon planned to charge $89,000 annually for what had been known as Deflazcort, a simple steroid. It has been on the market for decades, and is sold overseas for as little as $1 per dose. But Marathon acquired rights to the drug, pushed a small study that showed it appeared to boost Duchene’s patients strengths, and, renamed it Emflaza. It then won designation for it as an exclusive therapy for a rare pediatric disorder, making it exceedingly more valuable. Valeant Pharmaceuticals became a Wall Street darling by pursuing a controversial strategy of rapacious acquisitions of other drug makers, taking their longstanding products and, particularly if they held a niche in the market, jacking up their prices. But that predatory strategy infuriated patients, regulators, and lawmakers in recent times, heightening the scrutiny of the company’s executives and their business practices. Throughout it all, Bill Ackman, the brash hedge fund manager and investor, championed Valeant, even joining its board during some of the company’s recent dark days. Despite his insistence that the huge stake he led his fund, Pershing Square, to take in the company was prudent and smart, it may not have turned out that way. Pershing has announced that it has thrown in the towel on Valeant, cashing out shares it acquired at an average cost of $196 at $11 per. Valeant-related losses for investors in Pershing are estimated around $3 billion, maybe higher. The company, which has seen major turnover at the top, has been shedding assets and has remained mired in scandal. When will federal regulators crack down on the increasing and increasingly bizarre hype of stem cell therapies, about which there’s a growing outrage—with reason? There’s a new, published report, for example, that three women with only moderate vision loss were blinded by an unapproved procedure in which so-called “stem cells” were injected in their eyes as a treatment for macular degeneration. Beyond being a one-off example of deeply dubious care—the women had fat cells removed from their hips and these supposedly were transformed into stem cells that would help regrow eye tissues (really? )—the Florida stem cell case has attracted high scrutiny because the procedure somehow made it on to a federally approved list of clinical trial trials (www.clinicaltrials.gov). This incident has occurred even as a Minnesota medical ethicist, who has published on the proliferation of unapproved stem cell therapies, has written how he saw broadcast promotions of such treatments for athletes’ pain, as given in a Salt Lake City strip mall office. It turns out that a local TV station quietly was getting paid to hype this medical care. What? I’ve written before about the work of the Minnesota academic and his colleagues in identifying the unchecked spread of “stem cell” treatment and authorities’ failure to oversee this burgeoning area of many claims. I see in my practice the great harms that patients can suffer while seeking medical services, and it is deeply disturbing to me that authorities seem to keep turning a blind eye to what’s clearly becoming a big health problem.